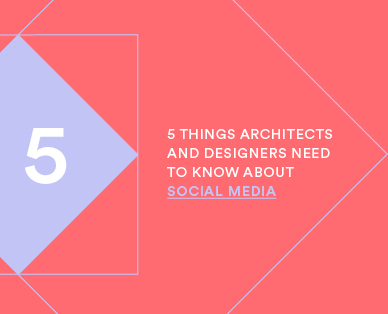 Martyna Kulczyk shares her top tips and tricks for architects and related professions using social media. There are countless social media platforms, and even more ways of using them. Twitter, LinkedIn, Instagram and Facebook are the tools of choice in the built environment industry, and are rapidly becoming more and more important. Social media is here to stay. There are many ways to keep your business top of mind for your clients. Social media is just one of these ways, but is an increasingly important one. It not only raises your professional profile, but positions you as an expert in your field, adding credibility to your work. It can ultimately help your business win work by building client, influencer and peer engagement. Social media makes the invisible, visible and is increasingly used by media outlets as a source for stories and features. Remember, it’s not about you – it’s all about your clients! Keep them at the centre of everything you write or post on social media. When posting, ask yourself – what will my clients find interesting? Is the content relevant to the reader, and am I using language they will understand? Avoid industry jargon and always be clear, concise and compelling. Start a conversation! All content should be designed to ENGAGE with your followers. Social media is not a free advertising platform to simply push content onto your audience. Where you can, use visuals on social media – this will get your post far more attention than words alone. It’s extremely important to use only the best architectural/design photographers to document your projects – give your work justice! These images are not only important for your website, but they can be easily shared on social media. When creating your own content, for example ‘under construction’ or ‘out and about’ photos, ensure you edit yourself. Compare your image to one your competitor might post. Your images should always be of the highest quality. Acknowledge your clients, consultants, collaborators, influencers and media outlets wherever you can. When you link to another user account, it boosts engagement, helps to strengthen your existing relationships as well as helping you form new ones. It also increases exposure of your business if the receiver chooses to share your post amongst their network. Be collegial and it will pay off! Personal social media accounts reflect on your business. There is an increasingly blurred line between platforms that are for professional use and personal use (for example Twitter and LinkedIn). Your public accounts should always reflect you in a professional context, but remember to remain human and conversational – let your audience get to know you. If you choose to keep some platforms for personal use, ensure they are private and not viewable by the public. If you need help on social media, don’t hesitate to contact Lindy Johnson – we’re always here to help.